Scientists tested the IceMole drill on the Morteratsch glacier in Switzerland, where it melted the ice successfully. To see if life does lurk beneath the frigid crust of one of Saturn's moons, scientists are developing a powerful drill that can melt and bore its way down to the moon's icy depths. Giant jets of water ice have been seen spewing into space from cryovolcanoes on Enceladus, Saturn's sixth largest moon. When NASA's Cassini spacecraft flew through these icy fountains, the probe detected organic compounds that hinted at the possibility of life. But the problem with investigating cryovolcanoes for alien life is that landing directly on them is too risky. Furthermore, any potential traces of life could be destroyed during their launch from the fissures and subsequent exposure to the hostile conditions of space. Instead, researchers are envisioning ways to dig into the icy crust of Enceladus to look for signs of life in the water that is thought to lurk beneath the moon's surface, before the icy fountains burst upward. The concept is to establish a base station that is a safe distance from a cryovolcano on the surface of Enceladus. This base station would power a probe dubbed IceMole, which is designed to melt and drill its way down to a depth of 330 to 660 feet (100 to 200 meters) at speeds of about 3 feet (1 meter) per hour. The IceMole is put into operation and, slowly makes its way to the lake underneath the Morteratsch glacier in Switzerland, as it melts through various layers of ice. IceMole is a rectangular box about 6 inches by 6 inches by 47 inches (15 centimeters by 15 centimeters by 120 centimeters) in size. Its square head holds 12 separate heaters that can reach up to 77 degrees Fahrenheit (25 degrees Celsius). After IceMole reaches its target — a cryovolcanic crevasse filled with water it is hoped — it aims to sample the liquid, examining it for evidence of microbes. The project, called the Enceladus Explorer, or EnEx, was formally launched on Feb. 22, and is led by the German Aerospace Center. "EnEx deals with one of the most exciting tasks of space exploration — the search for extraterrestrial life," Oliver Funke, project manager for the Enceladus Explorer at the German Aerospace Center, told SPACE.com. The IceMole in its element: the probe melts its way through the ice of the Morteratsch glacier in Switzerland with no problems. It will prove hard for IceMole to burrow its way to water, given the lack of reference points for navigation — for instance, it can't guide itself by the stars, and it can't navigate with a compass, as Enceladus lacks a stable, well-defined magnetic field. Nevertheless, IceMole will have to establish its position and distance to its target, calculate the best route, consider its operating range and power consumption, transmit data back to the base station, and take evasive action, if necessary, to avoid obstacles such as embedded meteorites. The probe should do so by combining a variety of sensors, such as ultrasonic arrays, with guidance systems in the base station, Funke said. 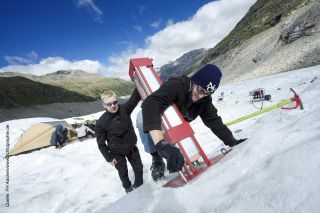 So far, the probe built by the Aachen University of Applied Sciences in Germany has already successfully melted through the ice of Morteratsch Glacier in Switzerland. Within three years, a battery of additional field tests are scheduled for EnEx — on Alaska's Matanuska Glacier in April 2013, on Antarctica's Canada Glacier in the McMurdo Dry Valleys from October to December 2013, and for the first-ever extraction of a water sample in uncontaminated conditions from a lake far below a glacier, the Blood Falls at Taylor Glacier in 2014, also in the McMurdo Dry Valleys. If these endeavors are successful, the plan is to propose an IceMole device for a mission to Mars to investigate its polar ice caps, Funke said. "Further engineering steps to achieve this goal are necessary, which can be performed within a further three to five years," he said. "We hope that the demonstration of the required technology will make a mission to Enceladus more interesting for ESA and NASA."